Two StFX faculty members have been elected by their peers as new Fellows of the Royal Society of Canada (FRSC), national recognition as the best in their field. 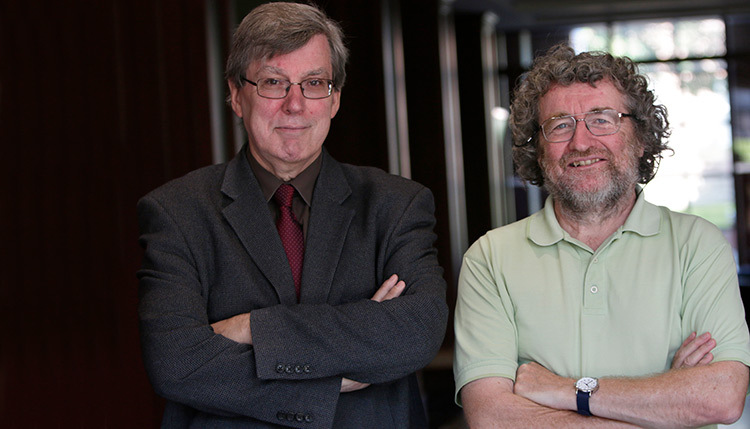 Philosophy professor Dr. William Sweet and earth sciences professor Dr. Brendan Murphy are among 89 new Fellows to be inducted into the Royal Society of Canada this fall for outstanding scholarly, scientific and artistic achievements. “This is a very formal acknowledgement of the exceptional work and contributions that Dr. Murphy and Dr. Sweet have made to their respective disciplines over many years. This award is well deserved and I applaud Dr. Sweet and Dr. Murphy on this recognition and on their distinguished careers,” says StFX President Dr. Kent MacDonald. “This is a significant accomplishment and it speaks to the quality and value of our faculty at StFX. It is exceptional that StFX has had two nominees elected in the same year for this distinguished award,” says Dr. MacDonald. The two StFX faculty members are among four new Fellows elected from Atlantic institutions. Dr. Murphy, who has taught at StFX since 1982, is best known for his contributions to understanding the supercontinent cycle, one of the most significant developments in earth sciences since the discovery of plate tectonics. He has led a wide range of study over his career in an effort to improve understanding of mountain building processes and the long-term history of global environmental change. Dr. Sweet, who joined the StFX faculty in 1990, is an internationally recognized scholar of the idealist movement in 19th- and early 20th-century Britain. His careful, historically-grounded and innovative scholarship on this movement has led to a re-evaluation of the work of some of its key figures and of its bearing on contemporary political philosophy as a whole. His research has also led to new insights into the impact of idealism in East Asia, India, and southern Africa, and the promotion of intercultural philosophy. The recipient of numerous awards and honours, Dr. Sweet has been invited to present his work across the globe. The formal awards ceremony will take place in Winnipeg, MB in November. “It’s a little humbling,” Dr. Sweet says of the award, and also gratifying that colleagues recognize the value of your work. It’s a sentiment echoed by Dr. Murphy, who is quick to talk too of equally deserving colleagues. Both thanked those involved in nominating them, particularly Dr. Richard Isnor and John Blackwell, their respective departments for the support over the years, and credited family support as invaluable. Dr. Sweet and Dr. Murphy say they have been fortunate throughout their careers to work with excellent people. While technology allows faculty to stay connected in a way they never dreamed possible 30 years ago, they say, nothing beats face-to-face interactions with people. Passion and dedication and putting in the time and work are also key, they say. Dr. Brendan Murphy has led a stellar academic career in StFX’s Department of Earth Sciences where he has excelled as a researcher and professor for over 34 years. He teaches courses primarily in structural geology, tectonics and the evolution of the Earth. He has served as Chair of the department for nine years and has supervised more than 80 student thesis projects since joining StFX in 1982. He has held adjunct professor status at six other universities around the world. Dr. Murphy’s main research interests are the geological processes that form mountains and how they relate to the changing positions of continents through geological time, otherwise known as plate tectonics. He is best known among his peers for contributions to understanding the supercontinent cycle, recognized as one of the most significant scientific developments in earth sciences since the discovery of plate tectonics. He is recognized as one Canada’s premier tectonists, as well as a leading expert on the Appalachian orogen of eastern North America and its European counterpart, the Variscan orogen. His research has involved field studies and scientific collaborations around the world. An outstanding teacher and mentor, Dr. Murphy has supervised over 50 undergraduate student theses, 19 masters theses, and nine PhD dissertations through adjunct professorships and collaborations at other universities. He has also supervised three post-doctoral fellows and been a research collaborator and mentor to numerous young colleagues at StFX and around the world. He was the first faculty member to introduce an earth sciences course aimed at non-majors at StFX. He has served as an expert reviewer for the University Partnerships in Cooperation and Development Program (funded by the Canadian International Development Agency) and the Natural Sciences and Engineering Council of Canada (NSERC) Solid Earth Sciences Committee. He is a current editor of Geology, the world’s premier journal in the Geosciences, and is past editor of Geoscience Canada and of the Geological Society of America Bulletin. His research has been continually supported by NSERC since 1984. Dr. Murphy has published over 290 scientific articles in academic journals, book chapters, monographs, or geological field guidebooks, and has authored or coauthored more than 200 conference presentations. He has received numerous awards for outstanding research, including the prestigious Killam Research Fellowship in Canada. In fact, in 2010 he was the sole recipient of a Killam Fellowship who works at a small, primarily undergraduate university in Canada. In 2014, he was awarded the StFX University Research Award. He was recently awarded a Hadyn Williams Fellowship at Curtin University in Australia. He was recognized with the Dave Elliott Award: Best Paper in the Canadian Tectonics Group for the Geological Association of Canada in 2015. He was elected a Fellow of the Geological Society of America in 2012 and received the Geological Society of America Distinguished Service Award in 2011. In 2014, Dr. Murphy was named winner of the J. Willis Ambrose Medal from the Geological Association of Canada. Dr. Murphy has served as president of the Atlantic Geoscience Society and chair of the Science Atlantic Geoscience Committee. He has been selected as scientific leader for several UNESCO International Geoscience Program projects and is a frequent science columnist and media commentator. His outreach activities have led to two awards for his contributions to public education, including the StFX Outreach Award. Dr. William Sweet is one of the foremost Canadian academics on the history of 19th- and early 20th-century British philosophy, and one of the world’s leading scholars of British idealism. He has also contributed significantly to the philosophy of culture, intercultural philosophy, discussions of dignity and human rights, and the philosophy of religion. For over 25 years, he has produced influential articles and books on key figures of the idealist movement in Britain, and been a leading exponent in the reassessment of their work, particularly so far as it bears on issues of liberty, equality, and human rights in the contemporary world. Dr. Sweet’s work has challenged many of the received views of the idealist movement, but has also put into question the widely-held views that the idealists were close disciples of the German philosopher G.W.F. Hegel, and that they were an aberrant phase in 19th century British intellectual life. He is the foremost expert in the world on the British idealist, Bernard Bosanquet, and the leading commentator on his philosophy as a whole. Dr. Sweet has also contributed to the scholarship on political thought by organizing international conferences and collections of scholarly essays. These have stimulated many, particularly junior scholars, to write on idealism, expanding and deepening the study of this field. Dr. Sweet has also extended the scholarly understanding of British idealism by looking at its reception in the then British Empire, and beyond. In the Biographical Dictionary of British Idealism, for which he was general editor and authored some 50 entries, Dr. Sweet details the influence of idealism in philosophy in South Africa, India, East Asia, France, and the United States, as well as Canada. This work is continued in Dr. Sweet’s recent articles on idealism’s influence on major philosophers from Southern Africa and India. Dr. Sweet’s ground-breaking work on the reception of British idealism in Asia has led him to explore related themes. This has led to invitations to address scholars in South Africa, India, and China, and to the translation of some of Dr. Sweet’s work into Chinese. It has also led to frequent invitations to speak at major universities in China, India, and South Africa. Moreover, his ongoing work with the Fédération Internationale des Sociétés de Philosophie and with associated scholars has helped to bring the work of philosophers in developing countries to international notice. In parallel with his research into British idealism, he has made major contributions to historical studies in ethics and political philosophy. Particularly significant are his many publications and translations of the work of the 20th-century French philosopher, Jacques Maritain. Dr. Sweet’s work has been recognized by his election to the presidency of a number of learned societies, such as the Canadian Philosophical Association, and to the executive committees of international organizations, such as the Fédération Internationale des Sociétés de Philosophie, the Council for Research in Values and Philosophy, and the Istituto Internazionale Jacques Maritain (of which he is Presidente d'onore). He was recently selected as ‘Visiting Professor (Overseas)’ by the Indian Council of Philosophical Research. He is also a recipient of both the StFX President’s Research Award and the University Outreach Award. Dr. Sweet’s scholarship and the international reception of his work have led to his recognition as one of the leading scholars in the history of philosophy in Canada today.